ECVISION Flash Drive is the easiest way to transfer photos and videos between your iPhone, iPad, PC and other Android smartphones. Quickly free up memory on your iPhone or iPad, and instantly expand storage. i-Flash Driver using high quality chips and electronic materials, quality and safety performance data storage greatly enhanced. This Lightning and USB 2.0 connectors can be used with iPhone 6 6S 5 5S 5C , 3 in 1 OTG usb flash drive also can be used with other apple devices with the lightning connector,IPAD, iPad mini iPad air iPod Touch. Interface: USB 2.0 With dual interface both USB 2.0 & iPhone 8-PIN port, Can be used both for PC and Mobile Support plug and play Compact and convenient, portable, your phone no longer need to worry about storage. 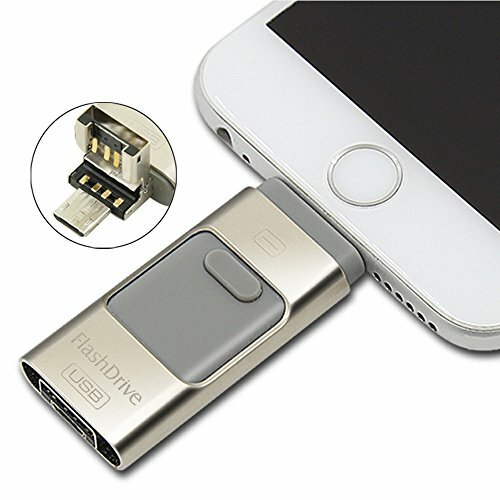 Support Playback Videos/Music directly from i-FlashDrive. Allows you to conveniently store and carry photos, music and other files Compatible with Smartphone, tablet PCs and other devices with OTG function. Compact size for ease of carrying Due to the inner system and procedure data will occupy some space and the real capacity will reduce lightly Stylish lightweight;portable,new concept modeling,classic fashion,compact. Brisk High Speed;data transfer speed. Please confirm your android phone can supports OTG before you buy.